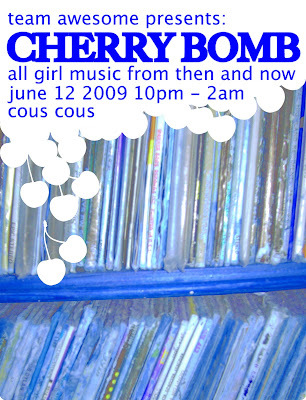 Lightning's Girl: Tonight : Cherry Bomb! Come see the 5 coolest ladies I know DJ with me tonight !!!! PS: I can't figure out why my computer is making this flyer blue when in fact it is red. Technology is not my friend. BRING IT ON HOME LADIES!!!!!!!!!!!!!!! MUCH LOVE FROM THE LORD!